After the visit of a 'Mughal prince’ two days ago, it was the turn of another historical figure to visit the Supreme Court premises on Thursday. 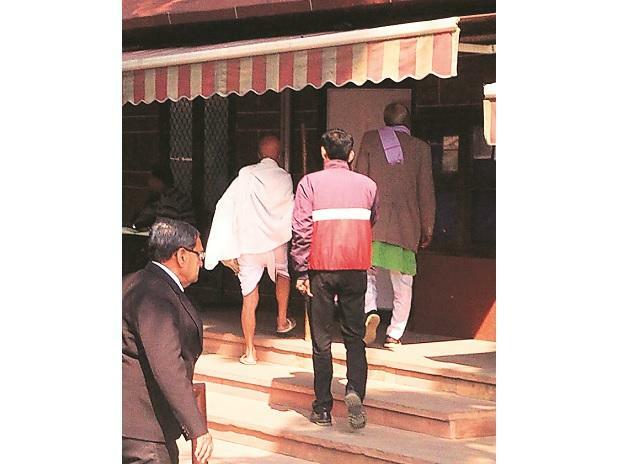 A man dressed as Mahatma Gandhi visited the court premises and was seen entering one of the court rooms. While it was unclear which case that gentleman was planning to attend, his presence did turn quite a few heads, thanks to his attire and gait. On Tuesday, a man who claimed to be the sixth generation descendant of the last Mughal emperor Bahadur Shah Zafar, had visited the court during the hearing of Ram Janambhoomi land title dispute case. Fourteen months after it was formed, the Justice (retired) A Arumughaswamy Commission, which has been probing the death of former Tamil Nadu chief minister Jayalalithaa, is nowhere near completing its task. The reason? No one seems to heed its summons. Former chief minister O Panneerselvam, who demanded a probe into the circumstances leading to Jayalalithaa's death, is finding it difficult to attend its sessions. He missed the Commission's summons for the seventh time on Thursday as he was visiting Delhi in connection with a case related to his party's (All India Anna Dravida Munnetra Kazhagam) symbol. He missed an earlier summons because he was busy forging alliances for the coming Lok Sabha election. Earlier, Apollo Hospitals, where the late chief minister was admitted till her death, had also urged the Commission to defer the appearance of its doctors stating that a related matter was pending with the High Court. Here is a challenge for next generation entrepreneurs and innovators. On Thursday, Union Minister Harsh Vardhan said it was up to them to completely abolish the use of single-use plastics by 2022. He said that while launching an anthem as a part of a campaign to make India plastic-free by that year. Prepared and produced by Pandit Deendayal Upadhyaya Smriti Manch, a non-profit organisation that works on various social and environmental issues, the anthem was launched in seven languages — Hindi, Marathi, Gujarati, Tamil, Telugu, Malayalam and Kannada. While launching the anthem, the minister also stressed on the need for plastic waste management and recycling.